One of the first steps in planning your New Orleans vacation is deciding where in the city you’d like to stay. A vacation where your days begin and end at a luxurious bed-and-breakfast in the Garden District will have quite a different flavor than a trip that finds you crashing in a haunted historic property just steps away from the 24/7 party atmosphere of the French Quarter’s Bourbon Street, a classy hotel filled with French antiques in a quieter part of the Quarter, a bohemian B&B in the Marigny or a sleek, contemporary hotel in the Central Business District. Of course, there’s nothing stopping an intrepid traveler from seeing things all over the city. Still, it helps to get a sense of each of the larger neighborhoods' overall vibes before you settle on a final lodging choice because it will be your home-away-from-home for your time in NOLA. The hub of the city and the oldest neighborhood in town, the French Quarter tends to be the focal point for most New Orleans vacations. It can be fun to get a room within stumbling distance of Bourbon Street, one of the world’s greatest (and, let’s face it, cheesiest) nightlife districts, and there are plenty of hotels that fit that bill nicely. There are lots of elegant properties in the French Quarter, too, some of which are haunted (or so they say), so ghost-hunters, this is one of your better bets. Others are gorgeously furnished with French antiques typical of early residents of New Orleans, and many have courtyards; these hotels truly feel like quintessential New Orleans. If drinking and nightlife noise are negatives for you, request a room that faces an inner courtyard rather than the street to muffle the inevitable noise. 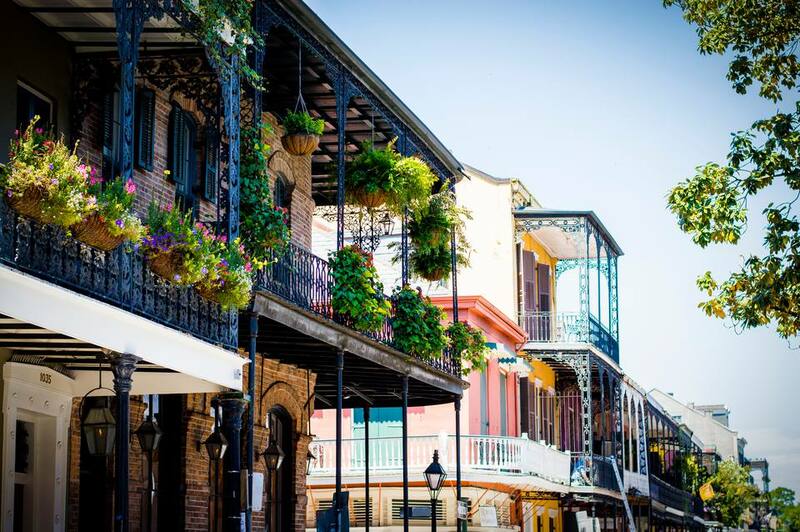 If you stay in the Quarter you'll be within easy walking distance of many fine restaurants, including the renowned Antoine's, pride of the French Quarter since 1840 for its French-Creole cuisine. Others are Galatoire's, Arnaud's, Brennan's and Acme Oyster House. You'll find boutiques, antique shops and Cafe du Monde, a can't-miss New Orleans icon, all within walking distance. The Garden District was originally the Anglophone answer to the French-speaking French Quarter. Settled by “Les Americains” starting in the 1830s, it’s a neighborhood full of imposing mansions and graceful landscaping. The majority of lodging options in this area are inns and B&Bs, most of which are in stunning historic homes. Though it’s not nearly as uproarious as the French Quarter (for better or for worse), there’s still plenty to do in the immediate neighborhood. Audubon Park and Zoo, the shops along Magazine Street, the gorgeous Lafayette Cemetery No.1 and a number of the city’s finest restaurants (including the legendary Commander’s Palace) all will keep you busy, and architecture and gardening buffs will love just wandering the gorgeous streets. The St. Charles Streetcar line offers an easy and picturesque trip to the CBD and French Quarter, so it's easy to get to downtown attractions. Conventioneers and business travelers will undoubtedly find themselves in the Central Business District (or the adjacent and often-combined Warehouse District) for business lunches, meetings, and other convention activities. This bustling area is home to the largest concentration of the city’s hotels. Given its proximity to the French Quarter and most of the city’s biggest attractions (Audubon Aquarium, National World War II Museum, Mardi Gras World, and so on), it is often a good choice for tourists of all kinds, despite the fact that the CBD itself isn’t the most charming or scenic neighborhood in the city. Travelers on a budget will find a good selection of generic but affordable chain hotels here, but it’s worth checking prices because sometimes unique properties like the International House Hotel have commensurate prices, especially in the off-season. Many luxury lodging options are also available here. Because this neighborhood is fueled by expense accounts, it’s where you’ll find most of the city’s finest restaurants, including several of Chef John Besh’s properties, the original Emeril’s, and Chef Donald Link’s Herbsaint. The Faubourg Marigny (FAW-burg MARE-uh-nee), or just “the Marigny,” is a youthful, hipster-heavy neighborhood -- sort of New Orleans’ answer to Brooklyn’s Bushwick or San Francisco’s Mission District. Home to the best music stretch in the city, Frenchmen Street, and lots of great, affordable restaurants and bars, it’s definitely the place to be for young, urban travelers (and bold, music-loving travelers of all ages). The Marigny is just a quick walk from the French Quarter, but at night, unless you’re walking with a fairly large group, you’ll likely want to zip over and back in a cab or take an Uber. Though it’s a generally safe neighborhood, there are some sketchy or poorly lit blocks here and there. Most of the accommodations in the Marigny (and the adjacent Bywater) are bed-and-breakfasts, and they tend to run a bit less than similar rooms in the French Quarter or the Garden District would. If you're looking for a unique, off-the-beaten-path alternative to more traditional New Orleans tourist options, this is a good choice.